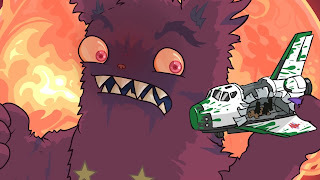 The Behemoth has always made funny games with weird premises, but in Pit People they have hit peak weird and I kind of like it. 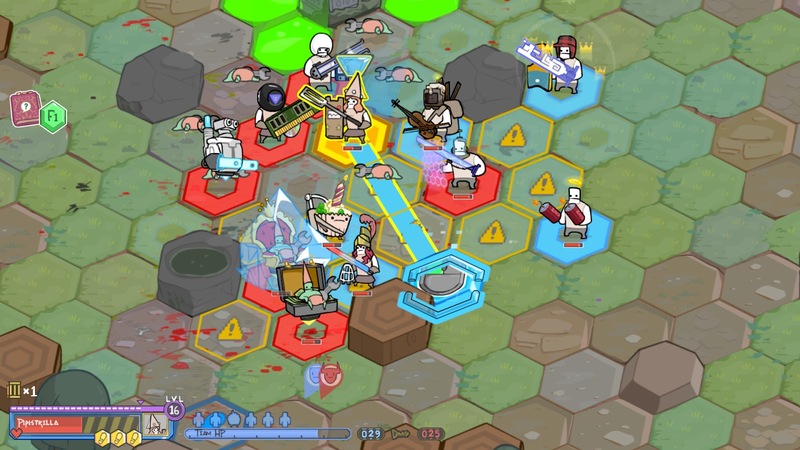 Pit People is a truly odd Strategy RPG game from the studio that brought us Castle Crashers, Alien Hominid and BattleBlock Theatre. 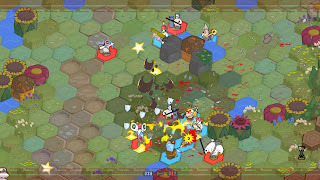 The game is as insane as it is hilarious and is only hampered by the somewhat tedious combat. 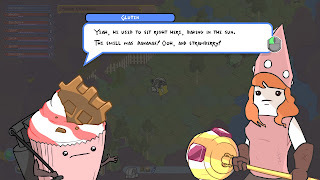 The story of Pit People is so weird it actually feels odd typing it. 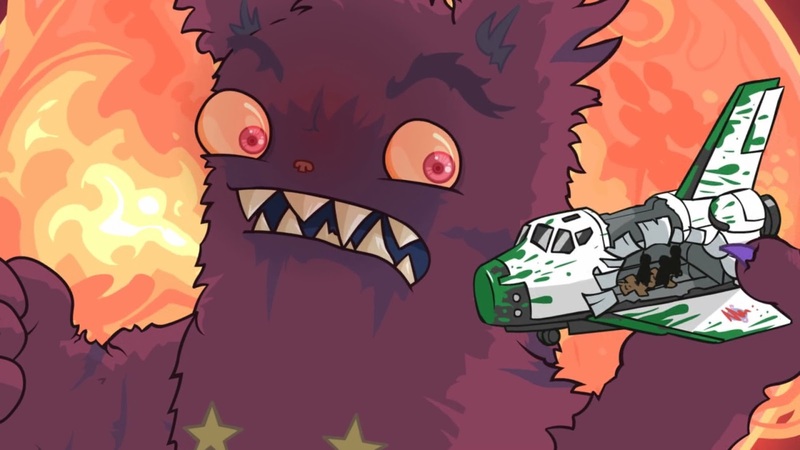 Essentially the tale revolves around a giant space bear that collides with a planet causing havoc for a Blueberry farmer called Horatio. The gigantic space bear has captured Horatio's son and is holding him hostage to torment him while the world goes bonkers. Horatio is joined by a Cyclops that is also his soulmate, a sentient cupcake who can heal, a battle princess, a conquistador pirate lady and a host of other characters you can enlist. These range from Gnomes and Hair Trolls to Vampires and Robots as well as a hoard of other weird creatures. Pit People is a strategy RPG which revolves around an overland map that is open to explore almost right from the start. Shortly after the game starts Horatio and his newfound companions enter a city where they have a house to call their own and use to customize the party. 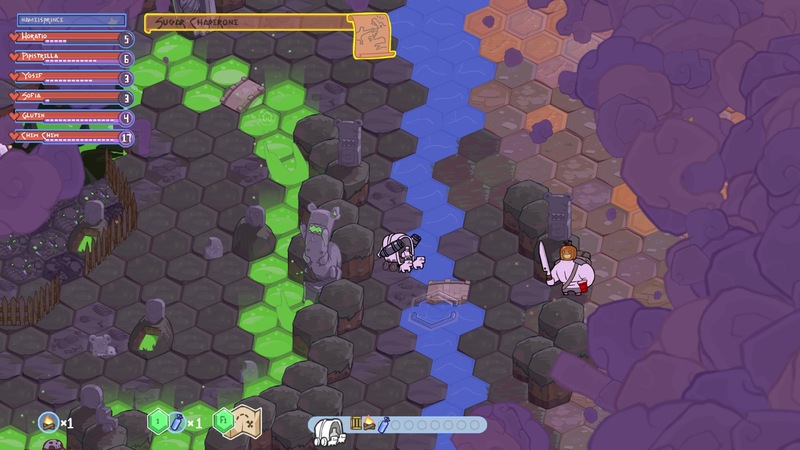 This city is the hub of the game and is constantly in a new location as the Space Bear picks it up and relocates it just to mess with Horatio and his friends. The city is where the market can be found to buy new gear and items as well as a Pit that the characters can fight through. The city is also where new missions and side quests are initiated. Once the game starts rolling the city becomes the place where all the planning an customization happens. 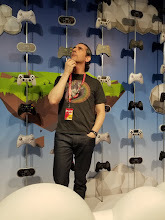 The meat of the game (aside from the jokes and humor) is the strategic combat and that is unfortunately where it fails a little bit. Missions are obtained in the city and then the team sets off to find the marked location. Overland travel is tedious and there is no fast travel back to the city which can get annoying after the mission is done. Once you get to the mission location (and avoided or engaged in wandering monster battles on the way) there is often a humorous cut scene and then the action starts. It is not always kill X creatures, sometimes there are objectives or shortcuts to end the scenario. In all cases it takes a long while to resolve each battle. Part of this is because the movement distance is pretty small for all the characters, but mainly it is due to the fact you cannot select who your character attacks. If they are in range of two creatures it is a roll of the dice who they attack and that can get frustrating fast. Battles often drag on because positioning prevents you from focusing on one creature at a time and generally there are multiple waves of baddies which extends the encounter. In battle there are no real options aside from positioning your characters strategically. Ranged attackers sometimes have attacks that affect multiple tiles and some characters have weapons with special modifiers on them. Where you place your cupcake healer thingy makes a big difference as does placing shield bearers. If shields are in the lead position they often deflect projectiles for other characters. There is one really cool persistent thread in the battles and it is the recruitment system. If one creature is left alive and there is a character with a net they will automatically capture the last creature if it is in range. Once captured they are added to the roster. This opens up all sorts of combinations including some tougher creatures that require two of the 6 character slots. While combat is pretty simple and has limited control there is a huge amount of variety with the characters. 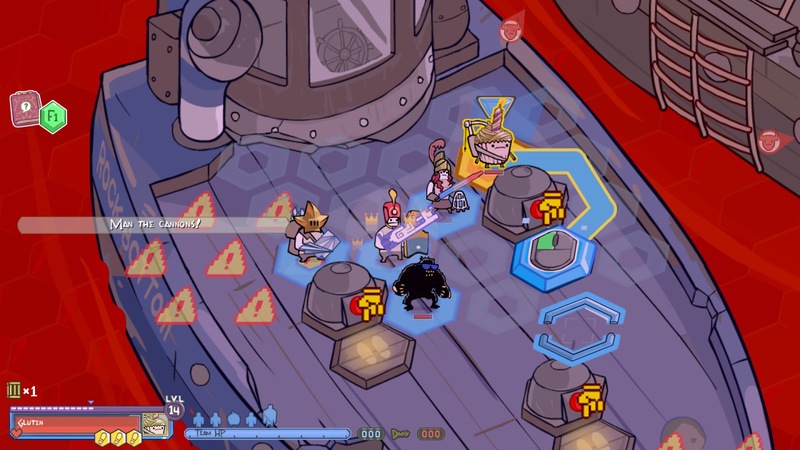 In nearly every mission multiple loot drops are obtained which have weapon and cosmetics for the party. The weapons are sometimes pretty standard like a giant sword or bow, but most times they are ridiculous. My current party has a cosmic pop sword, two sticks of dynamite, a surfboard for a shield, peppermint frosting for the cupcake and a pizza slicer weapon. The cosmetics are just as varied as the weapons with bird heads, odd beards, thumb heads, masks and crazy hairstyles to choose from. Over the course of the game my crew looked weirder and weirder - I actually made it a mini game to see just how strange they could look. The cosmetics are just that - changes in appearance with no stat bonuses but it adds a fun depth to the game. 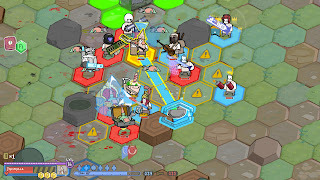 In the end I found Pit People to be enjoyable despite the tedious travel and oddly languid combat because of the story humor and visual flair. The game itself is well worth playing for the sheer experience. I hope The Behemoth will continue to tweak the game to make it flow in a more enjoyable fashion. If they do that then this could stand out as the best game they have made.